Bob Kasworm is the Country Director for CHI Health-Tanzania. He has worked with the 17 hospital CHI Health system for more than 35 years in a variety of technical and administrative posts. He has led the CHI Health Tanzanian effort since its inception in 2001. Bob has been living in Tanzania since 2004. In Tanzania he has various roles: coordinator of Health Advisory Services for the Northern diocese of the Lutheran Church in Tanzania, a member of the Machame Lutheran Hospital executive team, and administrative director of the Machame Orthopedic Centre (a partnership of Machame Lutheran Hospital and CHI Health). 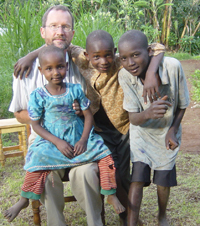 Additionally, Bob is the commissioned representative for the Nebraska Synod of the evangelical Lutheran Church of America (ELCA) in Tanzania and is a designated Global Mission Associate with the ELCA. He is a member of Lord of Love Lutheran Church of Omaha. “Much of my work with Tanzania boils down to being a bridge that assists in the transfer of aid, support and technology, but also information and understanding. This flow goes both to and from Africa. My great joy is in assisting others to become or build their own bridges to Tanzania”. All aspects of Program full under an Oversight committee with members appointed by CHI Health, Emmanuel, & Nebraska Synod ELCA. Houses for Health works closely with the Hospice/Palliative care/ Home care dept at Machame Lutheran Hospital. Visit www.machamehospital.org to learn more.